Yes, I am keenly aware that the end of summer and the onset of fall (one and the same, I guess, but the terms seem so different in the emotions they invoke) came and went well over a week ago. But those last few days of September never really feel autumnal unless you’re in New England or Alaska, so the real approach of autumn doesn’t start until October. Even October can be hot and miserable here in Southern California — just ask anyone whose home has been threatened by a Santa Ana-fueled wildfire. And then there was my wedding day, almost five years ago, where at 10am on that early October Sunday morning the temperature was a cool, crisp…. EIGHTY-FIVE DEGREES. Yeah, I get it. We don’t really have seasons in SoCal. But that doesn’t stop me from loving truly seasonal food. To me, autumn means stews, and rich soups, and winter squashes, and oh-good-lord-I-don’t-think-I-can-stand-to-eat-more-thing-made-out-of-persimmons. And going even further back into my memory, autumn meant the advent of hunting season, when my grandfather and sundry other male relatives would don blaze orange and tote around rifles while hiking through the woods and stalking Bambi’s dad. This was serious stuff, the hunting was; my grandparents even had a second freezer in their garage to store the butchered meat that Grandpa would bring back from his expeditions. There would venison stew meat, and venison ribs, and so many other cuts that I couldn’t even tell you what-all was in there. I have a distinct recollection of making venison chili with my grandfather once; I also recall someone, maybe my mom, muttering that we should check the chili for buckshot before we ate it. These days the “hunting expeditions” my grandfather goes on involve donning blaze orange and driving off into the woods to… play pinochle. So my access to venison has been exceedingly restricted. Have you ever tried to find venison in the store? No? Well.. unless you enjoy engaging in futile crusades, don’t even bother. I went to five grocery stores and three butcher shops before I even found someone who would special order it (thanks to Max at The Meat House in Brea for stepping up for me). Six weeks into my crusade I was finally able to bring home two pounds of cherished leg meat. The quest for making Hunter Stew — my first foray of the year into fall foods — was about to begin. So, OK, let’s be frank. For the most part, stew meat is stew meat. After you add all the other stuff to it, the meat you use is almost inconsequential as long as it came from some kind of mammal. Some meats are gamier than others. (And if anyone ever asks you, “gamy” just means intensely flavored, like beef plus a little bit of liver.) In order of gaminess, it pretty much goes veal/beef/buffalo/wild boar/lamb/goat/venison. Game meat also has a tendency to be leaner, so it shouldn’t be cooked as long. So if you’re dead set on venison, by all means — hunt it yourself, dress it yourself, and dig in, OR find a sweetheart of a butcher who’s willing to bring it in for you at about $15 a pound. This recipe calls for 2 pounds of meat. 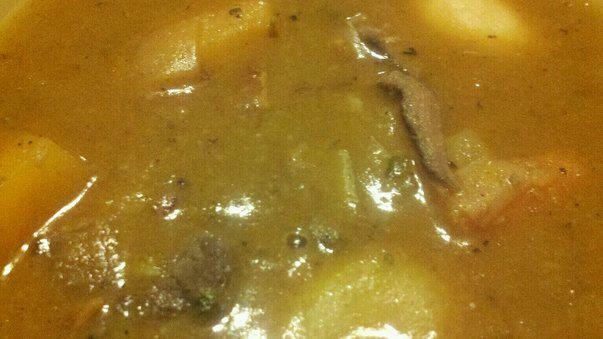 It’s a dang good stew, but I don’t know if it was worth $30 plus the cost of the veggies and whatnot. Probably would have been just as good with buffalo, which would have been about a third cheaper, or with some grass-fed beef chuck. And as for sides, well, there’s really only one you need: bread. 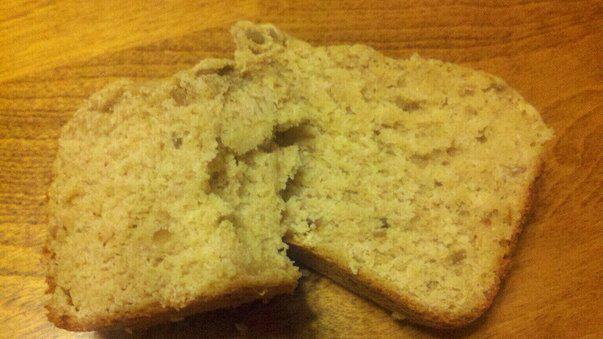 A good quality, dense, chewy bread. All your veggies and starches are already in the stew, so bread is the only other thing to think about. You could buy a crusty loaf, or if you’re feeling super-ambitious and wanna plug in your bread machine on the same day you haul out that slow cooker, then by all means try this recipe. Render the bacon in a heavy bottom pot until crispy; remove with a slotted spoon and set aside. Add olive oil to the rendered bacon fat in the pot. Season venison with salt and pepper and dredge in flour; add it to the pot, browning it well on all sides. If any oil remains, add flour to absorb and make a roux. Add the remaining ingredients to a slow cooker. Spoon in the venison and the reserved bacon; mix to combine. Cover and cook on HIGH for 4-5 hours or LOW 7-8 hours. Adjust consistency necessary with more stock and season again with salt and black pepper. Add to your bread machine in the order listed. Select the Whole Wheat Cycle for a 2-lb loaf. Once the loaf is finished baking (about 3 hours later), let it stand for another ten minutes before removing from the pan. Let stand an additional ten minutes before slicing. Yo may be able to get venison from Uncle Claude. He still goes hunting for Bambi’s dad.